Oil paint is made by mixing pigment with an oil binder. Painters have employed it long before it became popularly available (it had previously proved too expensive to use). Generally Jan Van Eyck (1385-1441) is credited with inventing oil paint as we know it (circa. 1410). In fact it had been used in the form known to us before the 15th Century but Van Eyck was a pioneer of many of the techniques used today. Oil has curiously evaded all of accusations of its obsolescence, despite it clearly being a medium less suitable practically and economically to its purpose than many mediums that have emerged since its development (such as photography, film and computer arts). The continuing success of oil paint seems in part to be due to a special status accorded to it by artists and collectors alike. Certainly, as a paint medium, it is very versatile and requires the sort of patience and skill that can lead a student to become embroiled in trying to master it! Oil is well suited to conveying both luminescence and opacity and can also be applied in every imaginable thickness, from the very thin to the very thick. A painting built up over time will show the marks of having been worked on for a long period (see Rembrandt, 1606-1669, and Frank Auerbach, 1931), yet Oil can also convey a very fresh and ‘new’ look if applied thinly with clear distinction between colours (see, for example, Francis Bacon, 1909-1992 and Patrick Heron, 1920-1999). Oil paint perhaps remains successful for the subtlety that it can convey in all disciplines of painting. From landscape to portrait to still life to abstract art oil can sensitively render the most minute detail, expression or atmosphere. No one can be sure quite why this is, and oil paints now legendary status bestows it with an almost mystical element far removed from its material make-up. 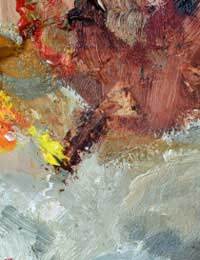 Oil paints vary greatly in quality from budget to student to professional quality. Ideally, a good student quality oil should suffice to begin with, such as those made by Spectrum paints. Aside from the paint good quality brushes and palette knives are needed, as well as a good supply of linseed oil and turpentine. This, together with canvas, is the basic kit required. Remember to buy a large tube of white paint, as you will probably use it more than your other colours, along with one each of the primary colours. If you buy these in good quantities you need not buy ready mixed secondary and tertiary colours, which are expensive and unnecessary. It is wisely but normally said that a beginner painter should spend too much money on their first set of oils. It would be wrong to get wrapped up with issues surrounding equipment when there is so much else to consider. Start with a basic kit and work your way towards something more ambitious only if you first see yourself reaping the benefits of oil. All paint is generally used in conjunction with mediums that are used to help thin, thicken paints, or to make them dry either more quickly or slowly. It is recommended that a few of these are purchased in order to gain the maximum benefit of oil painting. See related articles for more tips on technique.